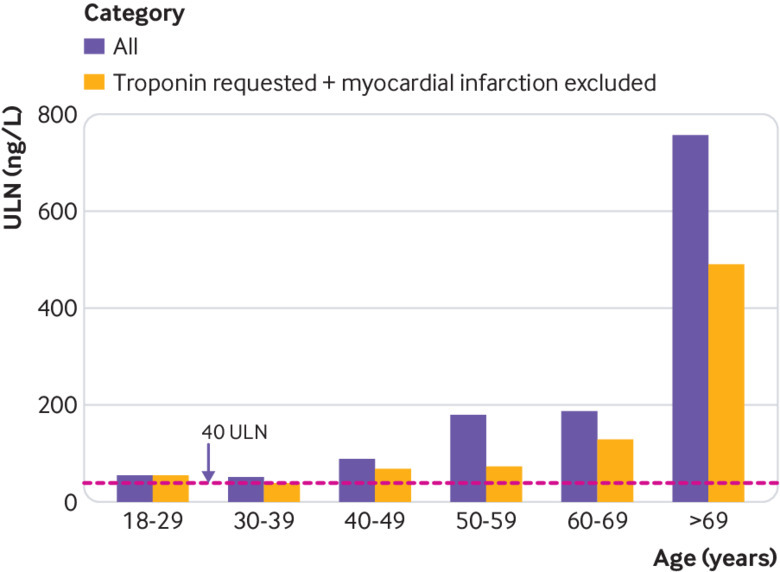 To determine the distribution, and specifically the true 99th centile, of high sensitivity cardiac troponin I (hs-cTnI) for a whole hospital population by applying the hs-cTnI assay currently used routinely at a large teaching hospital. University Hospital Southampton NHS Foundation Trust, Southampton, United Kingdom, between 29 June 2017 and 24 August 2017. 20 000 consecutive inpatients and outpatients undergoing blood tests for any clinical reason. Hs-cTnI concentrations were measured in all study participants and nested for analysis except when the supervising doctor had requested hs-cTnI for clinical reasons. Distribution of hs-cTnI concentrations of all study participants and specifically the 99th centile. 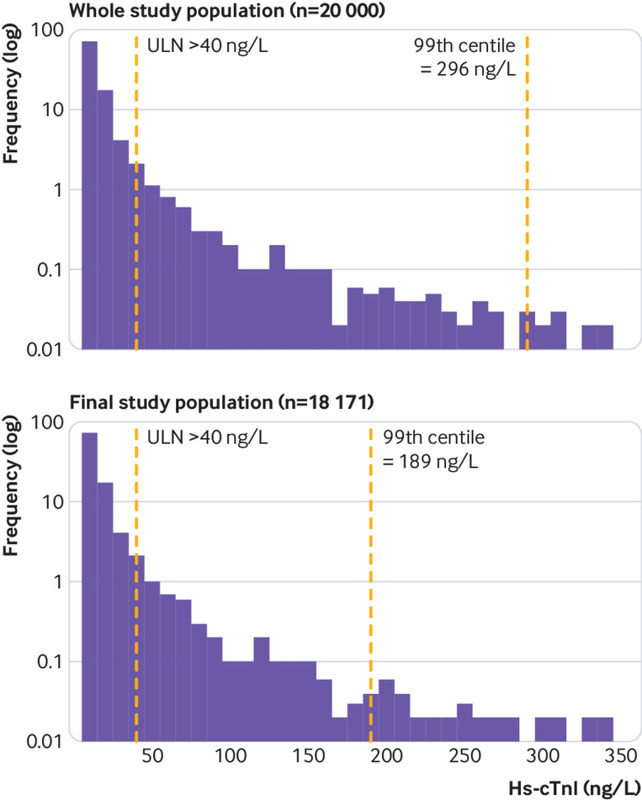 The 99th centile of hs-cTnI for the whole population was 296 ng/L compared with the manufacturer’s quoted level of 40 ng/L (currently used clinically as the upper limit of normal; ULN). Hs-cTnI concentrations were greater than 40 ng/L in one in 20 (5.4%, n=1080) of the total population. After excluding participants diagnosed as having acute myocardial infarction (n=122) and those in whom hs-cTnI was requested for clinical reasons (n=1707), the 99th centile was 189 ng/L for the remainder (n=18 171). The 99th centile was 563 ng/L for inpatients (n=4759) and 65 ng/L for outpatients (n=9280). 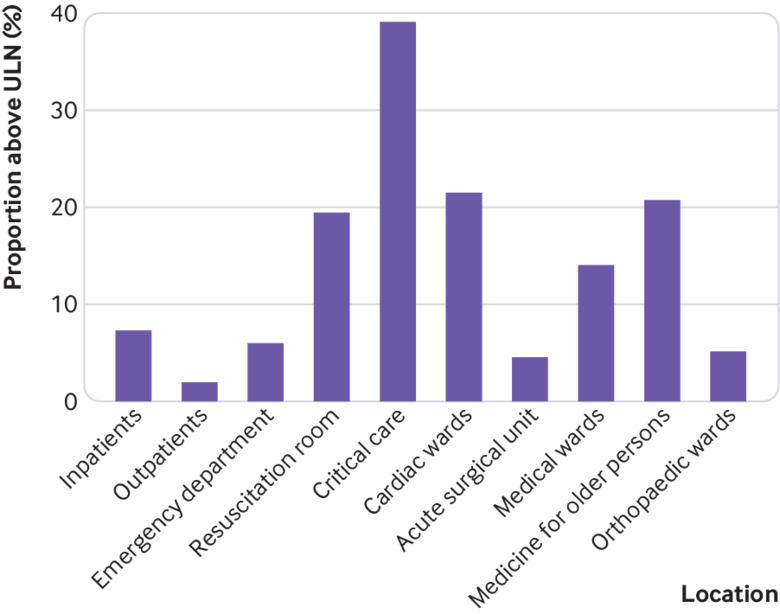 Patients from the emergency department (n=3706) had a 99th centile of 215 ng/L, with 6.07% (n=225) greater than the recommended ULN. 39.02% (n=48) of all patients from the critical care units (n=123) and 14.16% (n=67) of all medical inpatients had an hs-cTnI concentration greater than the recommended ULN. eGFR=estimated glomerular filtration rate; hs-cTnI=high sensitivity cardiac troponin I; ULN=upper limit of normal (40 ng/L). Of 20 000 consecutive patients undergoing a blood test for any clinical reason at our hospital, one in 20 had an hs-cTnI greater than the recommended ULN. These data highlight the need for clinical staff to interpret hs-cTnI concentrations carefully, particularly when applying the recommended ULN to diagnose acute myocardial infarction, in order to avoid misdiagnosis in the absence of an appropriate clinical presentation.